Congratulations to the Transplant Australia Football Club on their inaugural win in the seventh match promoting what transplant recipients can achieve following the gift of life. Playing a Belrose-Terrey Hills Representative II at Belrose on Saturday, March 3, the side played with great composure and stamina in stifling heat. With players from as far as Queensland including Tim Clark, Natalie Hazelwood, John Weiland, Nate Howell and Matty Hempstalk, and from Canberra Brad Stanley, the side was a new look makeup with several regulars out with injuries. The day didn’t get off to great start for the Transplant X1, as couple of players became ill overnight and had to withdrew, so the team started with squad of 11. BTH, in the spirit of the day, loaned the Transplant XI a few of its players, including Tim Bowland, a superb mid-fielder and living donor, who has a much higher claim to fame. He donated a kidney to his sister two years ago. Also joining the Transplant XI in parts of the second half from BTH were Richie and Steve Dowdall. Their connection with transplantation was quite personal – Richie’s dad, John, passed away last year after many extra years with a heart transplant. John lived in Ireland and represented that country at many European and World Transplant Games. Before the match the TAFC team spoke about how important the first 10-15mins were going to be to get a good result, and they implemented a tactical game plan to cope with that. “The opening 10mins was played at such high intensity and fast pace I was worried we wouldn’t see out the game as I didn’t have any subs to call on (as one of our players were running late) but the match settled down as both teams were trying to take control of the middle of park,” said Transplant X1 coach Matty Hempstalk. With new back-line and formation led by John Weiland the defence was, as usual, solid with keeper Rob Mihalic keeping many shots out. The entire back-line did a great job. A hard fought match, it was nil-all at halftime. 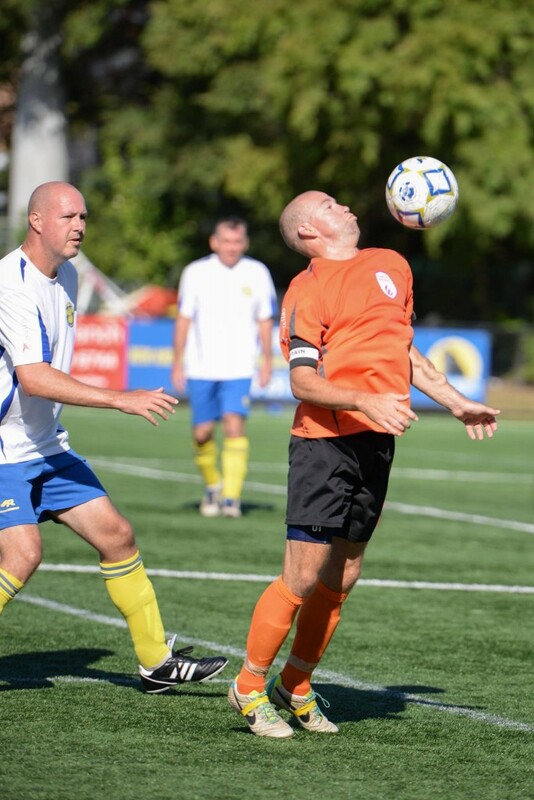 At halftime the Transplant X1 made some positional changes with Tim Clark, a physical education teacher from Brisbane and kidney recipient, moving from midfield to striker, starting to find his groove and creating many opportunities. Early in the second half the BTH side went ahead with a great ‘one-two’ from a rising star in Niamh who defied the opposition with his diminutive size (he’s only 12) and pace. It appeared the script was going along similar lines. However a shot from Tim Clark from 25 metres out bounced off the BTH defender’s head back to their goalie. Now Graham Mahn, a former Premier League goalie, is the man you would want in this situation. However a combination of sun in the eyes and a slight miscalculation saw the back-header fumbled into the goal. Perhaps a penalty shootout might be calling. With just five minutes to go, Clark latched on to a great cross, beat a central defender and fired it into the near post. A fantastic finish. The full-time whistle sounded. The Transplant Australia Football Club was the proud owner of the Doujon Zammit Shield for the first time. A great day out. 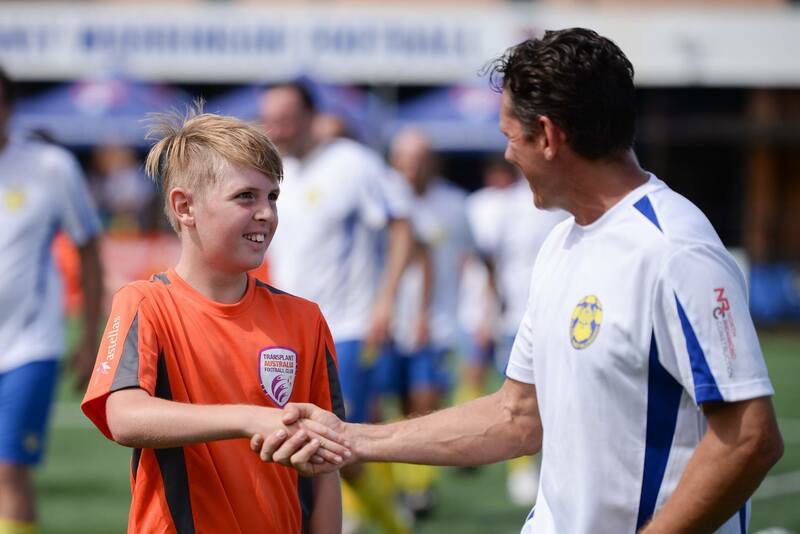 Thanks to the BTH Soccer Club for its support, especially Andy and Karon Saunders; to the Manly Warringah Football Referees Association for providing a referee; to the BTH players for their great spirit. A big thank you and congratulations to the Transplant team for coming from far and wide. The recipients who played represented an extra 97 years of life. Let’s hope for many more victories. Fantastic to see a win for the team. It’s such an inspiration to see the team achieve when I know just getting on the field is such a big effort for many of the team. Keep up the good work.